AND so the big man came to Kilburn, like I said he should. 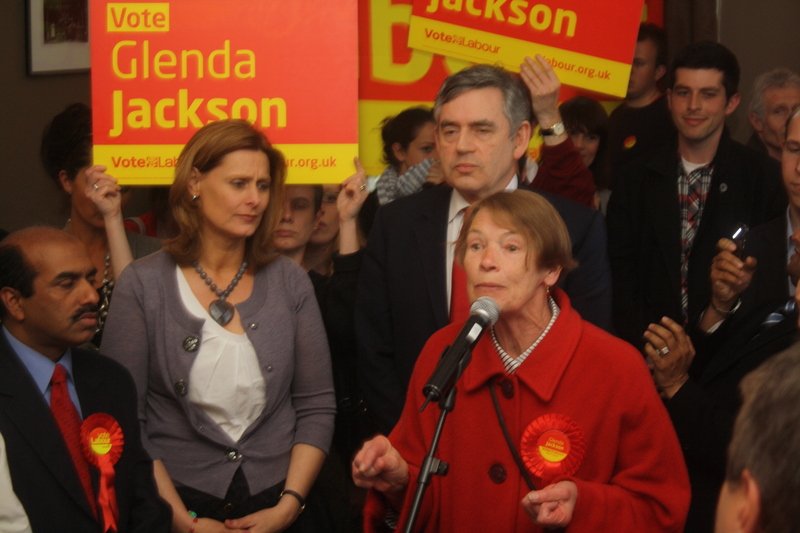 It was the least Gordon Brown could do in return for the loyalty of Glenda Jackson, an unashamed fan of the PM. The contrast with her apparent relationship with him and his predecessor at Number 10 is striking. Brown and his wife strode into the North London Tavern on the corner of Cavendish Road, warned us all about the threat of the Tories, told us all about the brilliance of Jackson’s contribution to the arts (not transport?) and then was off. He may have been an hour late – we heard his big entrance song Jackie Wilson’s Higher And Higher close to 50 times on loop – but Hampstead and Kilburn was a must-visit location on his whistlestop tour of ten London constituencies in one Sunday. If he was wearied by this manic tour, he didn’t show it. In fact, he looked like he particularly relished this particular stop, like if he could personally choose which under threat Labour MPs he would save from a polling day dance off, Glenda would be top of his list. In Labour campaign parlance, this event was a shout of ‘Game On’, a rallying cry to show that the number crunchers and strategists in Labour’s HQ haven’t given up on Glenda. It wasn’t a static photo opp, this was a party – a free bar and loud music, kids with balloons sort of thing. Absolutely nobody was to leave thinking that Labour are going into the final few days feeling miserable. No, silly. They are going to party like it’s 1997 again. Amid the early evening beer and clink of wine glasses and renewed excitement, however, cynics might have detected a lingering feeling that a lot of people here simply wanted to lift the worries of the last four weeks of campaigning and timewarp back to the Labour Britpop victories of the past. Sadie Frost (from the Pulp video) and Meg Matthews (formerly Mrs Noel Gallagher) were just showing their support, nothing wrong with that, but their presence inevitably seemed like a nod to when Blair used to have the pop stars in at Downing Street. You could almost imagine a squeaky inner voice of Labour’s press team just wanting to say: Remember that? We can be like that again. We can be cool. To his credit, Brown gave the Camden New Journal and the Ham & High a joint ask what you like interview in what seemed like the pub’s attic room. He was open but firm, albeit unsurprisingly lacking the quick wit and smirks that Blair used to deal with local hacks with. Sometimes, so keen to rap out his key points, it felt like Brown was giving an answer to a different question: For example, he struck out at Boris Johnson when I asked him about Camden Council’s sale of council homes at auction. Yet, as we we spoke, the merry men team Lib Dems in this area had surrounded the building. There the perishers were, clinging onto the side of the windows over here, parading placards the size of a house over there. Brown, if he caught a glance outside, might have felt like Butch Cassidy spotting the guns of the Mexican arm. I think they have gathered more support than Jackson gives them credit for. Amid the pushing and shoving outside, Brown left by a side exit. That’s not to say that the Labour posters didn’t bash away the Lib Dems outside in the street feud played out for the benefit of the TV cameras. Chants of ‘Glen-dah, Glen-dah, Glen-dah’ must have drowned out one piece-to-camera for the BBC. I saw a woman and a man in fierce dispute over a red balloon and a yellow placard. Others claimed it got rougher. It all lacked a bit of class. The Lib Dems looked like they had resorted to petty sabotage and Labour was quick to find the moral high ground by reminding the hacks that their members had not pursued Nick Clegg when he twice had come to the constituency. What worth Brown’s visit here has will be seen only in time. At the start of the campaign, I wondered whether Glenda’s team would want him to make her seat one of his first ports of call. But maybe things have changed during the campaign. That image of Brown bent over the Radio Two microphones as he heard his private words played back to him still haunts this campaign and the non Labour supporters in the Tavern yesterday were still making snide comments about bigot-gate. He can’t escape that now. But Glenda, for one, clearly thought his arrival will help. Her allies were reinvigorated and she was positively beaming. He’s sticking with her. She’s sticking with him. Will the voters stick with them? Not long to find out now. And as for him: Charity work calls. After all, John Profumo has made a real contribution. Ed Fordham is the only option to prevent a Tory win. Betting Odds !!! Nice to see the LDs taking the most important election since ’83 so seriously…. I heard Ed got a really positive fortune cookie once. Maybe you should put it on a leaflet? (2) You do know that bookies adjust their odds to try to make sure they make money no matter the outcome? Pile a load of money on and watch the odds shorten, an old LD tactic. Glenda could probablyget herself down to evens if she popped into Ladbrokes and put a monkey on. All complete rubbish. The real question is who’s got the experience to serve H and K at a time of crisis. Is it successful businessman and long standing community activist Chris Philp, or old style tribal “I hate the Tories” liberal democrat party campaign officer Ed Fordham?